1. Catarrhal inflammation à mucocele. General à Septicemia, toxemia, bacteremia or pyemia. 1. Usually it resolves within few weeks. · or burst into peritoneal cavity à generalized peritonitis. · Mucocele à pseudomyxoma peritonii. · Empyema or gangrenous type à diffuse suppurative peritonitis. · Appendicular abscess. (>48 hrs à points à rupture). · C/P: Dyspepsia due to reflex pylorospasm. General: Fever , Headache , Malaise . (Fever is of low grade). 1. Pain à Colicky in obstructive type . 1- At first: Generalized , marked around the umbilicus . 2- After few hours : localized in right iliac fossa , at MacBerney’s point . 5. Appendix may be felt on P.R. · Psoas test à Patient flexes right hip if appendix in contact with muscle. · Blumburg's sign à On & of pr. on Lt iliac fossa à pain in Rt iliac fossa. · History from 2-3 days. · Temp. > 38oC, more tachycardia & vomiting. 5. Sub hepatic à as acute cholecyctitis but pt. is young & hyperaesthesia in usual site. Investigation CB4 + leucocytosis, Urine analysis. 1. 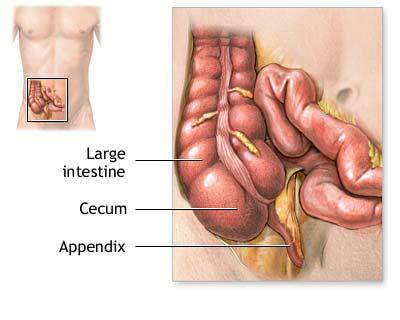 Acute appendicitis =à Appendectomy. 2. Appendicular mass = (Oschner-Sherren’s) then appendectomy after 3 m.
What is Oschner-Sherren’s regimen ? 5. Follow up chart, Mark of the mass to follow it. 6. Follow up of abdominal signs. 4. Appendectomy after 3-6 months.